Young musician and actress Ouyang Nana who was born in Taiwan has recently taken a stand in a long-standing political issue through a declaration she made that was posted on her Weibo, Instagram and Facebook accounts. It started after Beijing TV did a piece on the four most promising young actresses in China (four dan actresses). These were Ouyang Nana, Guan Xiatong, Wendy Zhang and Vicky Chen Wenqi. However, a red graphic was placed over Ouyang Nana in what seemed to be an attempt to block her out from the photo of the four actresses together. 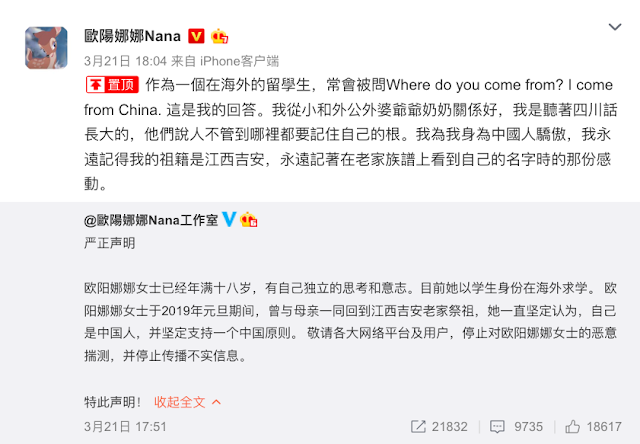 Just as people speculated that the reason for the censorship had to do with her family's political views, Ouyang Nana's work studio released a statement to say that Ouyang Nana is already 18 years old and has her way of thinking and free will. Although she currently studies abroad, she returned to her hometown of Jiangxi province with her mother to pay respects to their ancestors this past New Year's Day. The studio also says that Ouyang Nana has always believed that she is Chinese and that she fully supports the One-China policy. The studio also asked netizens to stop malicious speculation and desist from spreading fake news. In a follow up post, Ouyang Nana says that being a foreign student in the U.S., she gets frequently asked "Where do you come from?" She always answers that she comes from China. She also mentions that she has always been very close to her grandparents and that she grew up listening to their native Sichuan tongue. Ouyang Nana remembers that they taught her not to forget her roots and that she is proud to be Chinese. She also says that she will never forget her hometown of Ji'an in Jiangxi province and the moment when she saw her name on their family tree.